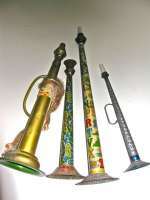 Different tin Llithographed trompets. About 1900. Size and Price from left to right. Litho, flowers, 22 cm........................115 Euro Goldpainted,. 27cm.............................85 Euro Litho, letters....32cm.........................130 Euro Impressed design...12,5 cm..............100 Euro Very good condition.The shown price is the "middle-price"